Earlier this summer, I reviewed the Robusto format of the new Drew Estate Florida Sun Grown line. I mentioned that, in addition to the four Brazilian-wrapped standard vitolas, there is also a Limited Edition Trunk-Pressed Toro with its own unique blend, and that’s the subject of today’s review. To bring you back up to speed, two years ago we broke the news that, for the first time since 1977, long-filler cigar tobacco was being grown in Florida. Jeff Borysiewicz, owner of the Corona Cigar stores and a partner in the Sindicato cigar company, began growing tobacco on land he had purchased—out of love of the leaf, and to avoid paying residential taxes on the land, which is outside Orlando. At the time, while we knew Drew Estate had been selected as Borysiewicz’s partner, it was unclear how the tobacco would be incorporated. In May, we learned it would be used in a blend from Drew Estate aptly called Florida Sun Grown (FSG). Drew Estate Master Blender Willy Herrera paired the Floridian filler tobacco with Nicaraguan leaves, a Mexican binder, and a Brazilian wrapper. As I mentioned above, however, the Trunk-Pressed Toro (6 x 52) sports a different blend. It has a Connecticut Broadleaf wrapper, Mexican binder, and filler tobaccos from Florida, Nicaragua, and Honduras. It retails for $15 and is packaged in boxes of 10 (the standard four vitolas retail for $11.50 to $15 and come in 20-count boxes). The FSG Limited Edition Trunk-Pressed Toro has a beautiful exterior leaf that’s dark, moderately oily, slightly reddish, and covered in a network of (mostly) thin veins. The foot exudes pre-light notes of green raisin and cocoa powder. The cold draw is smooth and clear. 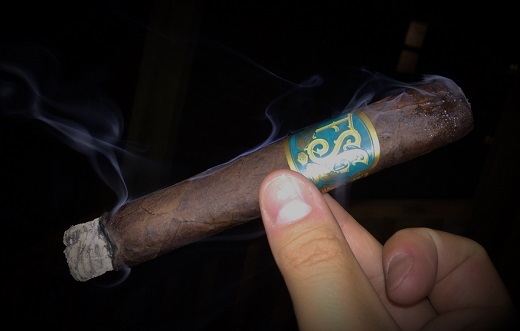 Just like the standard vitolas, it is adorned by a handsome band of teal, orange, and gold that interestingly makes no mention of Drew Estate, nor does it designate the cigar as a limited edition in any way. After establishing an even light, I am immediately struck by how much more Mexican-tasting the Trunk-Pressed Toro is than the regular-production Robusto. This is a gritty, dirty cigar with a highly chalky texture. Background notes include espresso, black pepper spice, and a touch of the sweet grassy sensation that’s prevalent in other Broadleaf-wrapped smokes from Drew Estate. Full-bodied from light to nub, the profile picks up some creaminess at the midway point, only to grow spicier and more intense down the home stretch. Cayenne heat fades in and out throughout. The gentle box-press renders the Toro almost oval in shape, which I find very comfortable and unique. Combustion qualities are superb, including a straight burn line, solid ash, and an easy draw that yields above-average smoke production. For now, FSG is only available at Corona Cigar stores, or at Corona Cigar’s retail website. However, rumor has it Borysiewicz would like to see FSG go national. If that happens, the exclusivity at Corona Cigar will likely be remembered as a soft launch. Either way, you need to get your hands on this cigar. It’s expensive yet highly enjoyable and supremely satisfying, especially if you’re not averse to Mexican tobacco. The Florida Sun Grown Limited Edition Trunk-Pressed Toro is a joy to smoke and worthy of an admirable rating of four and a half stogies out of five. A dirty, gritty cigar with a highly chalky texture doesn’t sound like a 4 1/2 stogie score to me. Describing the flavor of a cigar is as subjective as taste itself—and it’s no easy task, either. We do the best we can in every review. I found this smoke to be highly complex and satisfying, though surely some will disagree. That said, if this profile doesn’t sound up your alley, you might want to spend your $15 elsewhere.